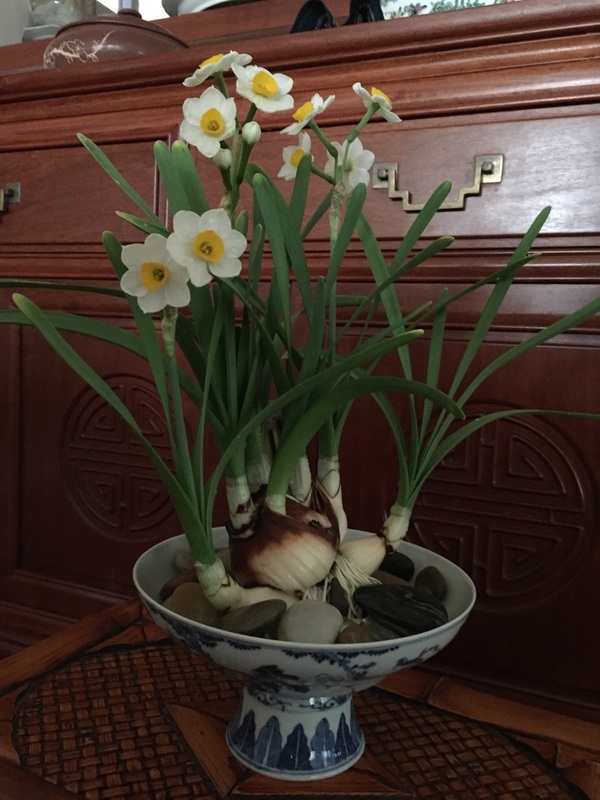 Chinatown usually sells narcissus bulbs about 2 months before Chinese New Year. 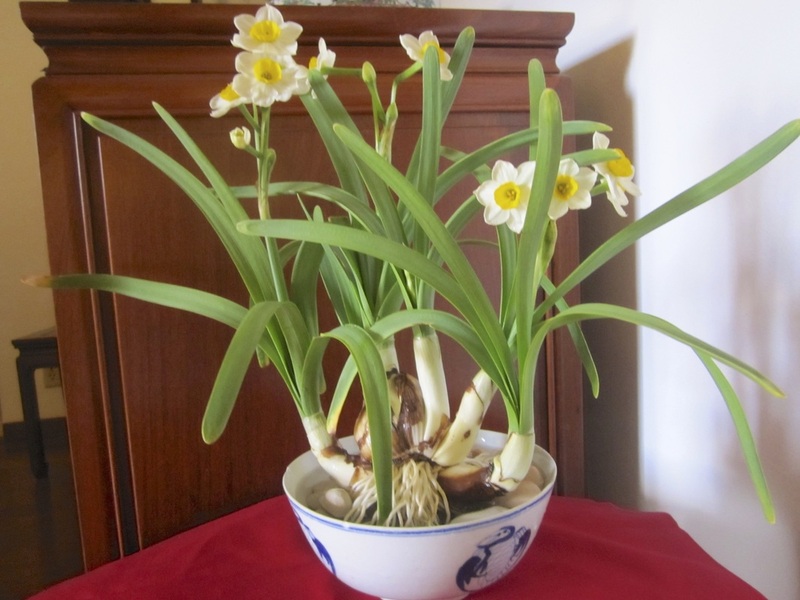 These bulbs are imported from the Fukien province of China. 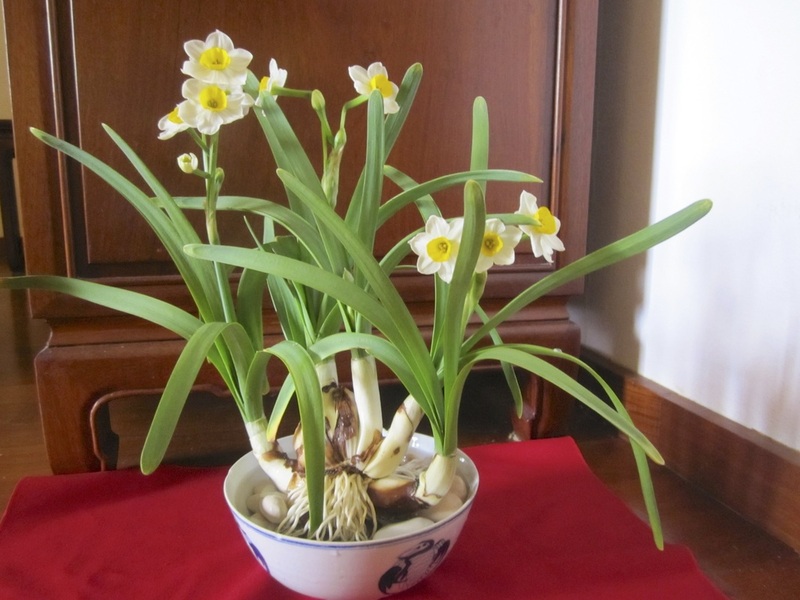 Bulbs are cleaned about 25-30 days before the estimated time narcissus bloom. 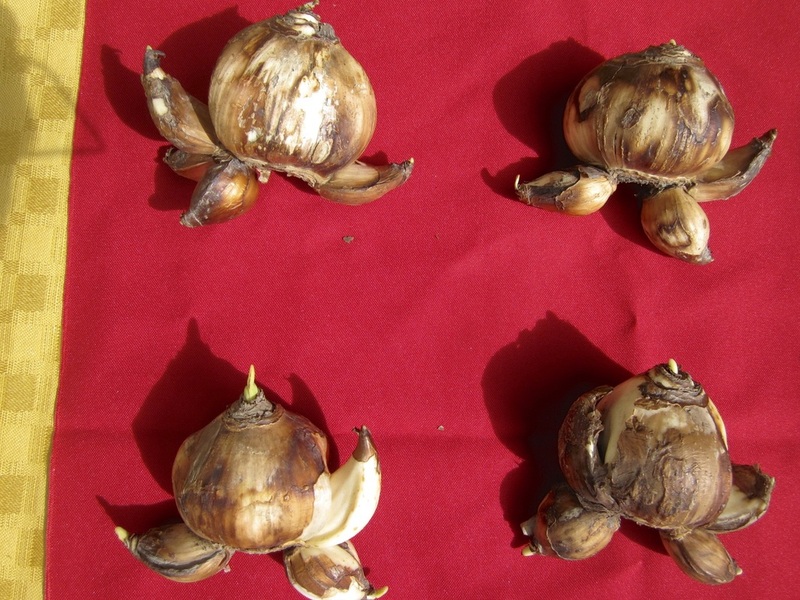 everydaytaichi ken selects bulbs that tend to be more elongated than round. 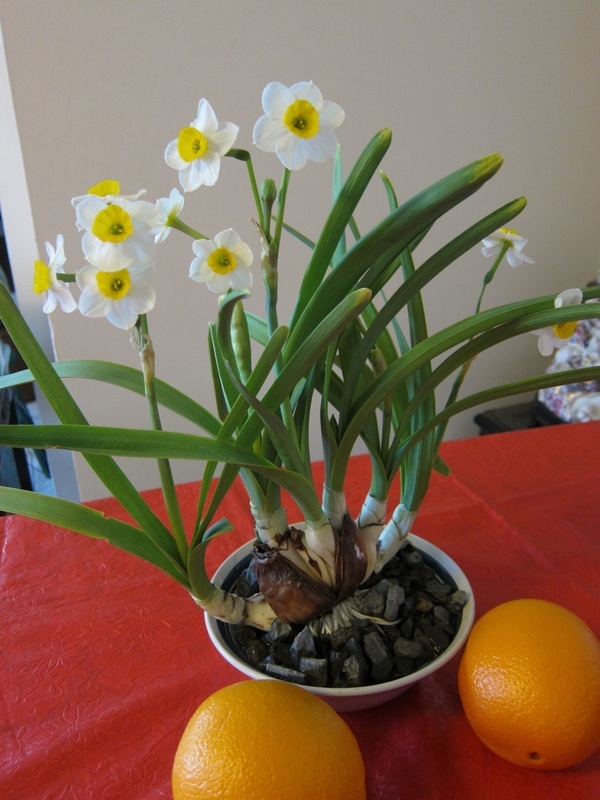 This minimizes the presence of non flowering bulbs which tend to grow from the sides of the round bulb off the main axis. 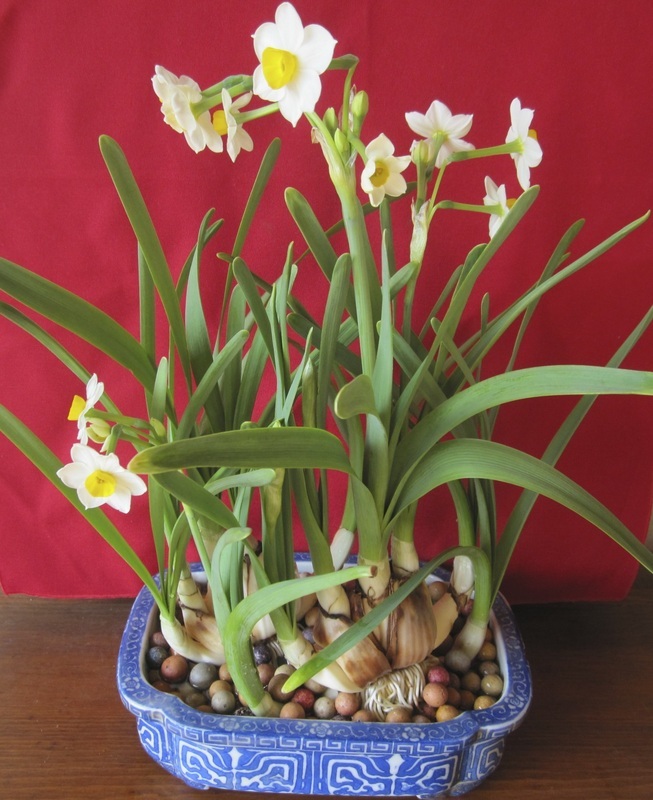 Bulb clusters containing exposed bulblets can be chosen according to the grower's intention or desire. 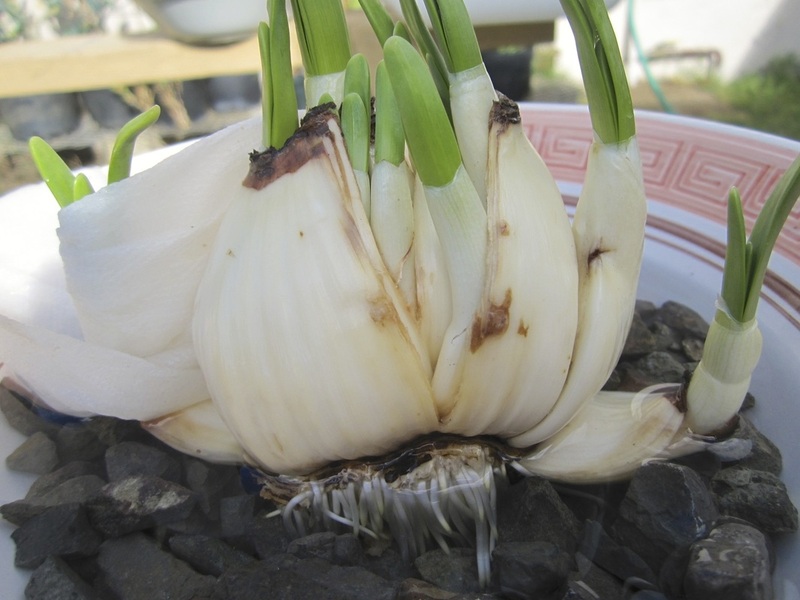 If you are doing long tradition culture avoiding excessive down pointing bulblets is suggested since you need to remove these if you are going to grow the plant upright. 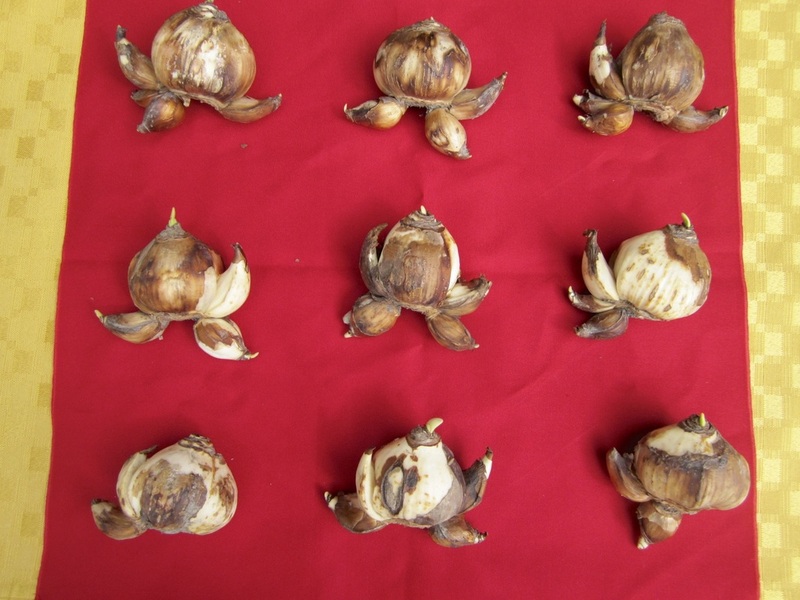 Crab culture are easier to culture using flat elongated bulbs, because the flower sacs are aligned in one plane along the long axis of the bulb. 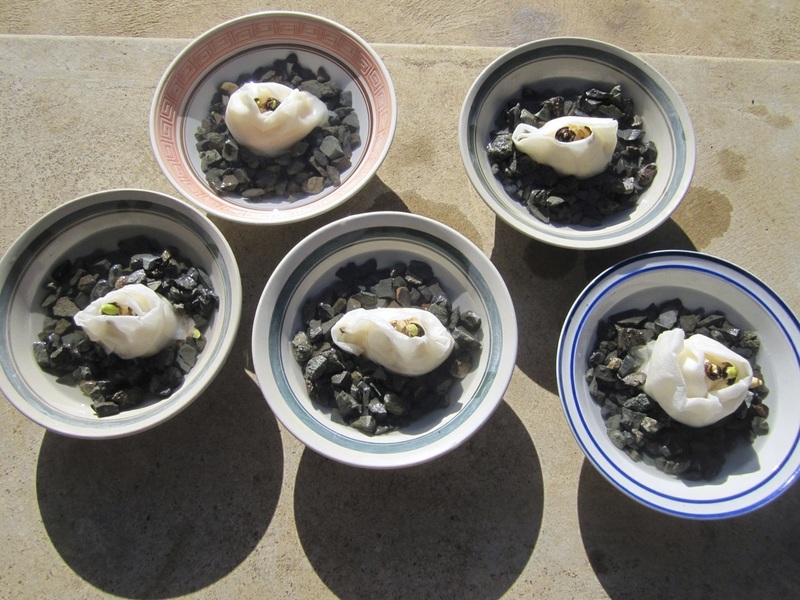 There is less tendency for hidden side bulblets to be present deep in the uncarved side. 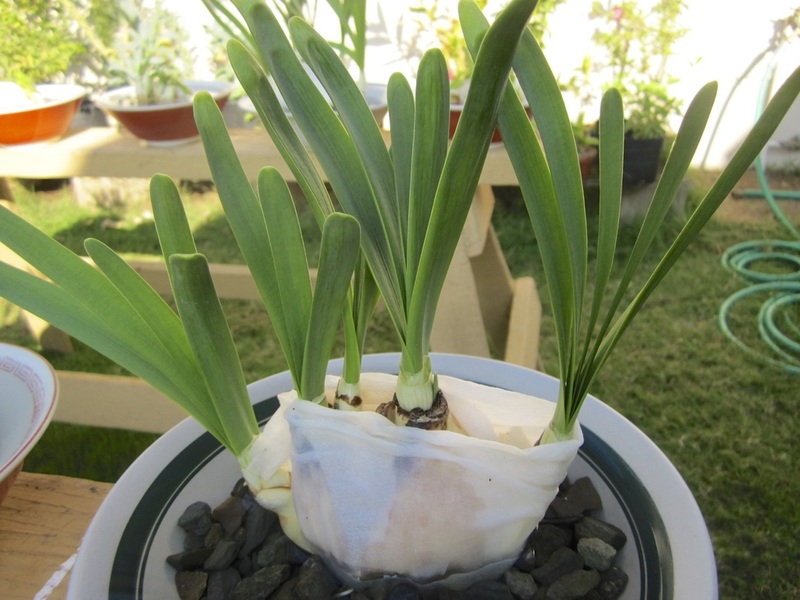 The growth of these side bulblets are difficult to control. 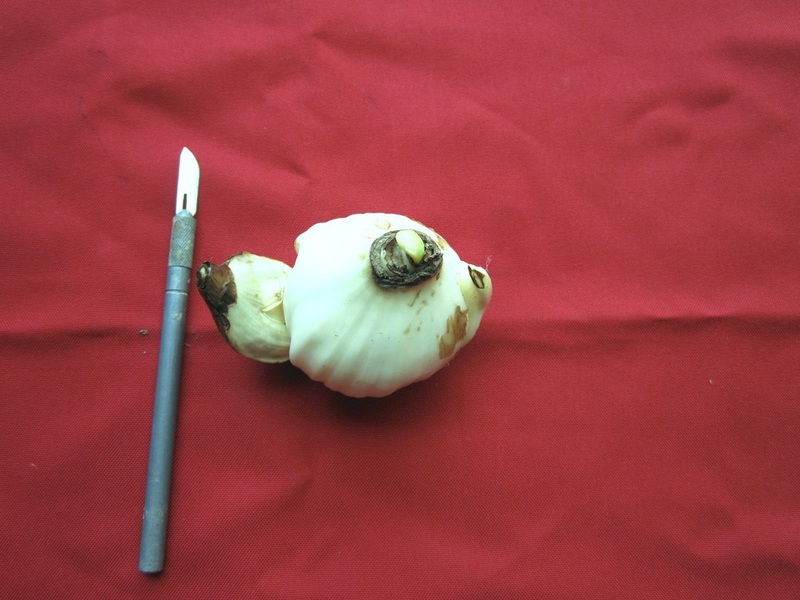 This bulb is more elongated than round is shape. 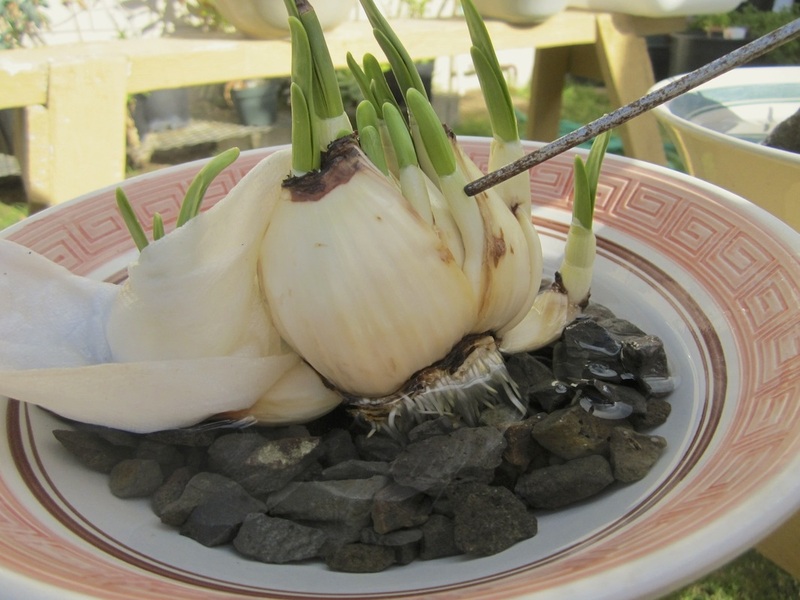 Images below show the preparation for the long stem or traditional narcissus culture as oppose to the crab claw type narcissus culture. 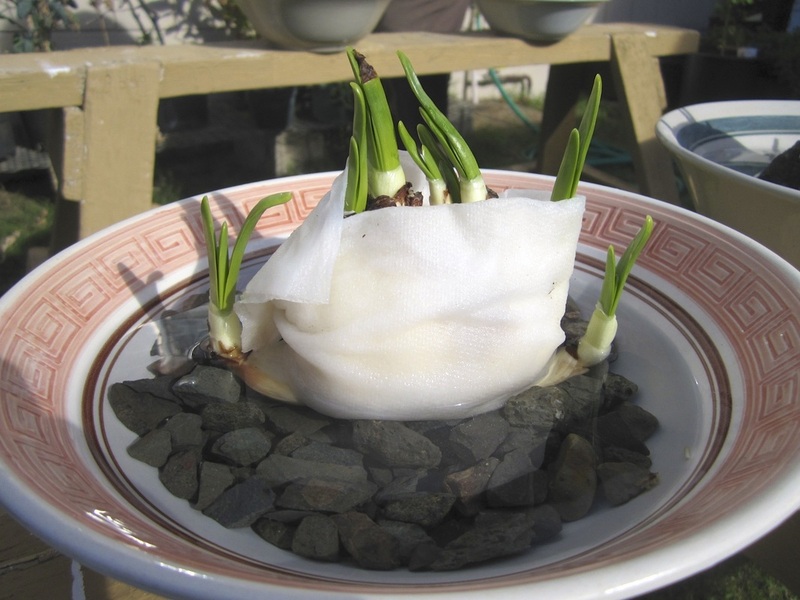 Click here for how to prepare narcissus bulbs for crab claw culture. 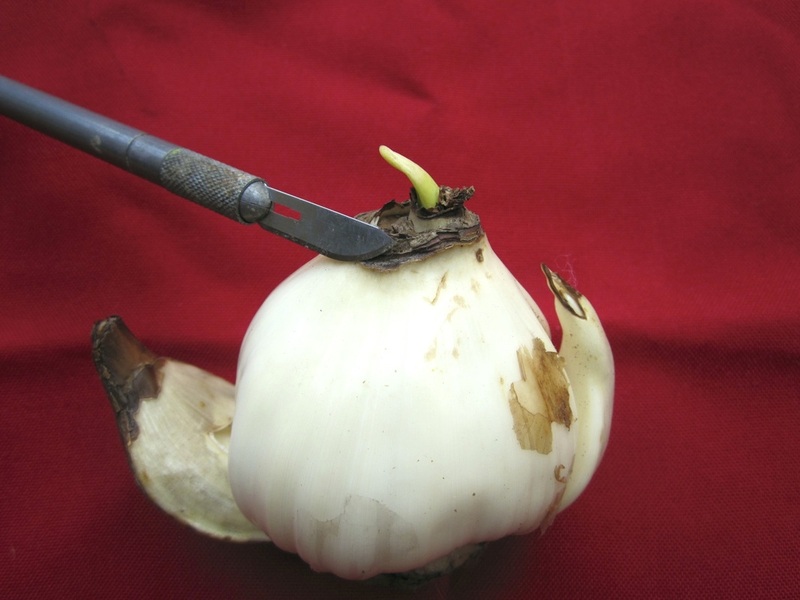 Preparing for cutting the bulb to provide relaxing incisions to encourage symmetrical growth. Location of incision site is on the side of last year's growth. 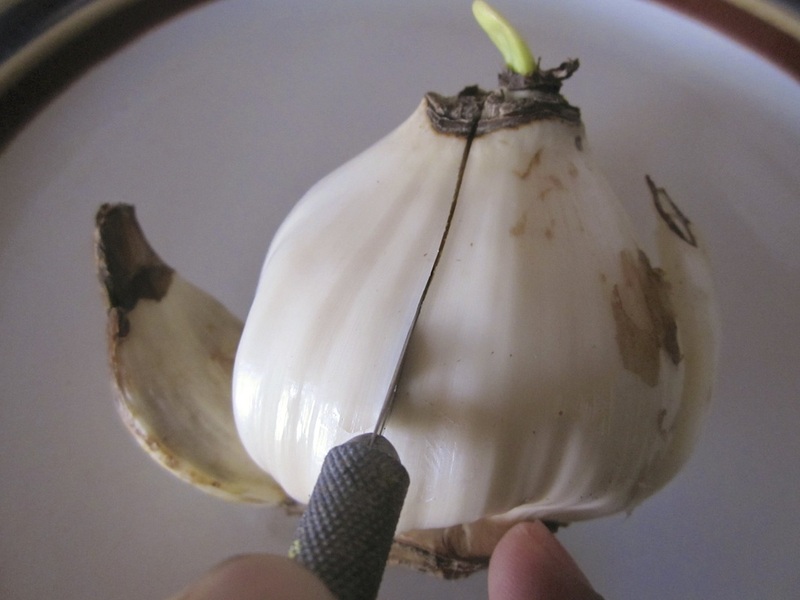 Incision goes about 2/3 down the bulb, initially shallow with option of widening the lengthening the incision later. 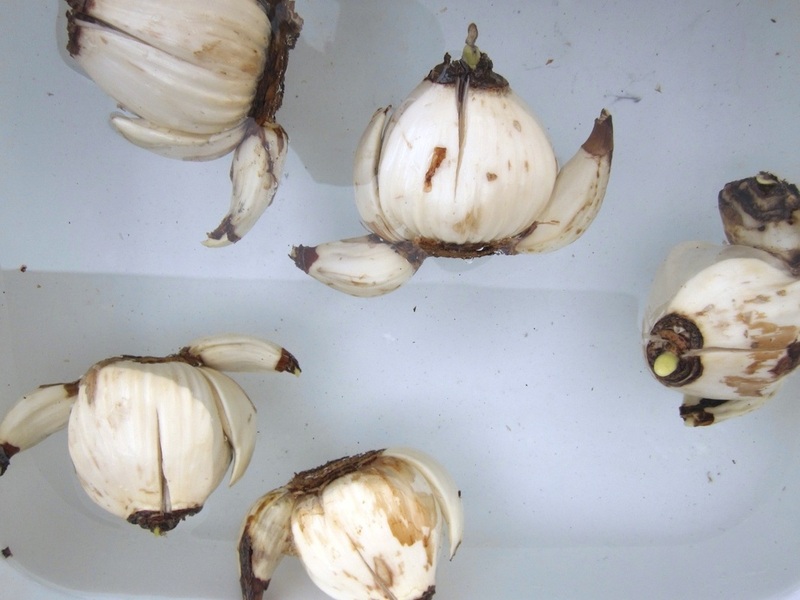 Soak bulbs in clean cool water. 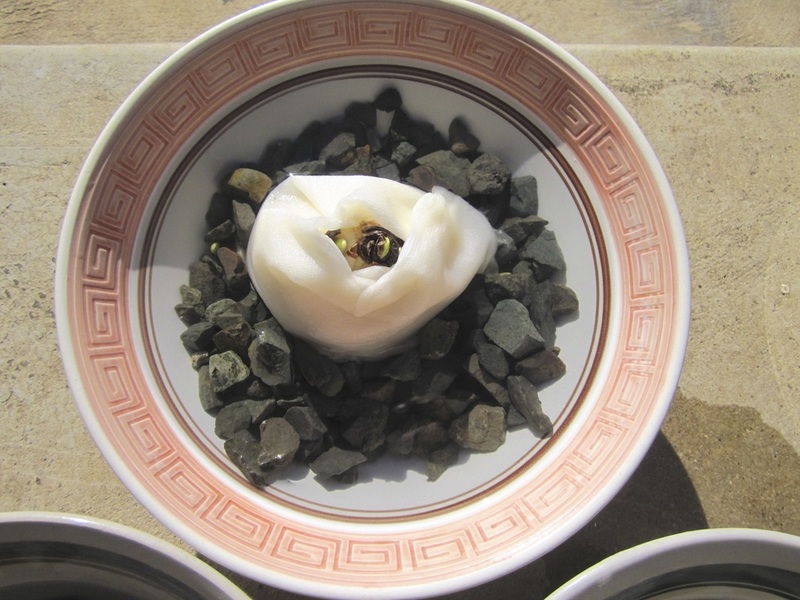 Massage bulb to remove air bubbles and allow water to penetrate the inner portion of the bulb. 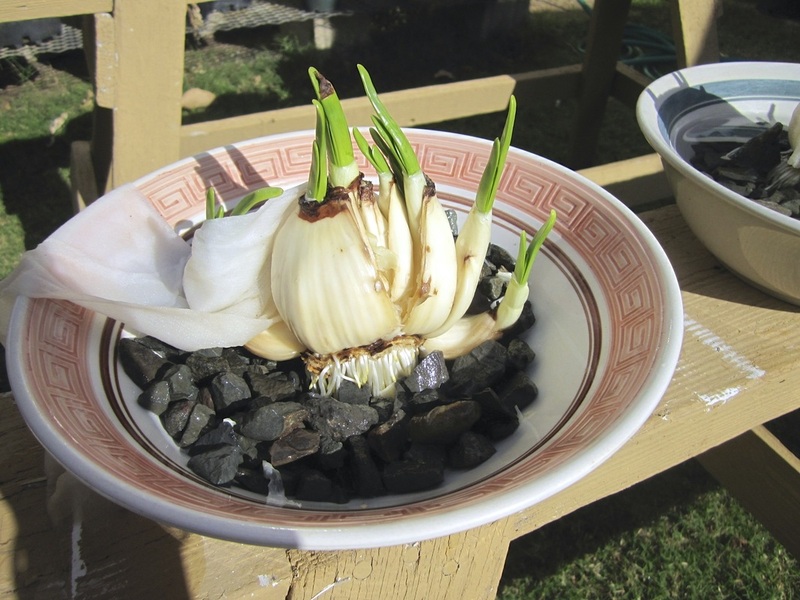 Soak bulbs for 24 hours to hydrate. 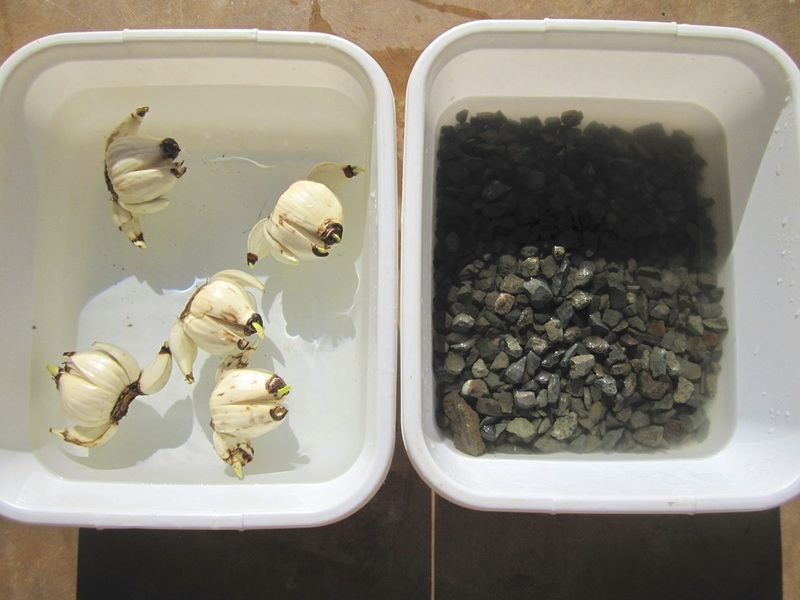 Bleach sterilize gravel well rinsed with water. 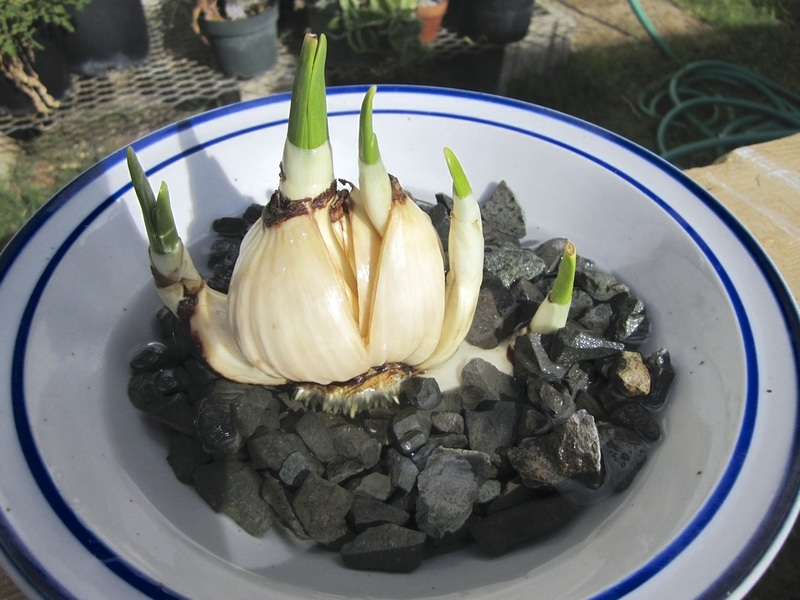 Bulbs after final cleaning and removal of slimy residue. 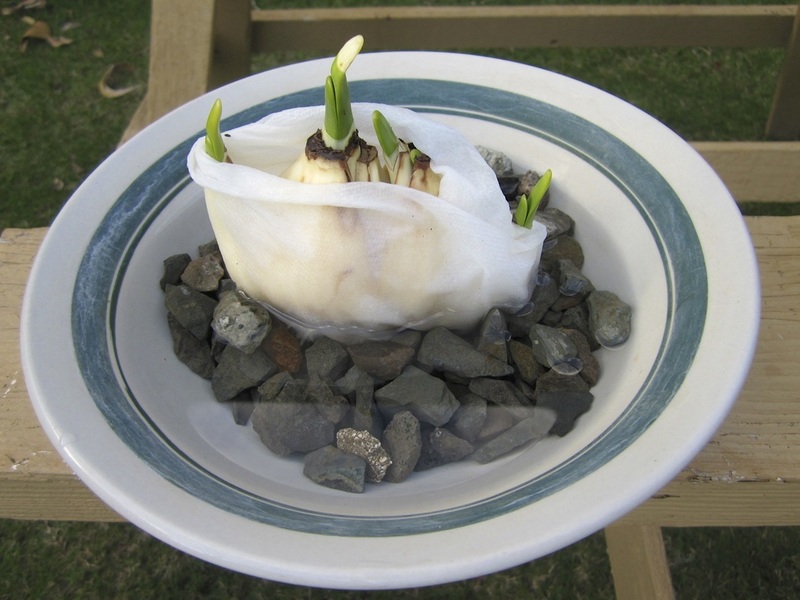 Bulb has been wrapped with folded paper towel for sun protection. 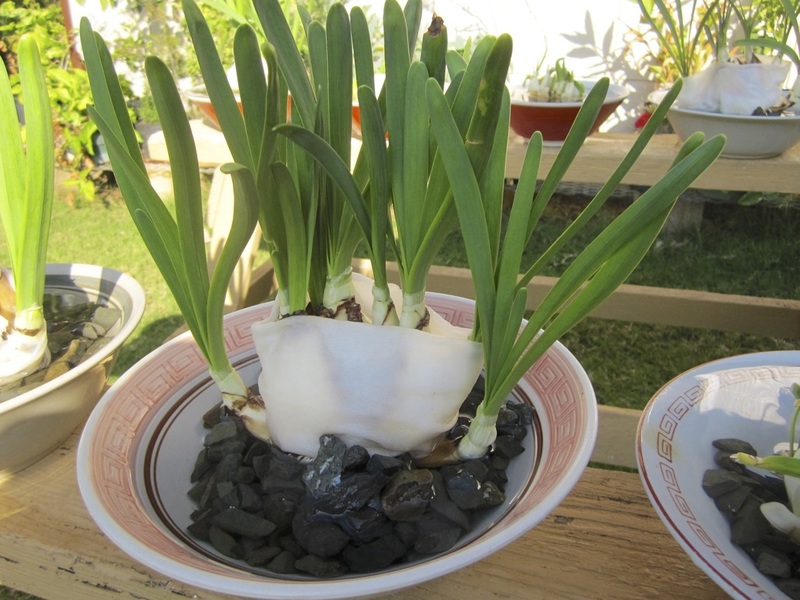 Then, stabilized in gravel and water to cover the lower third of the bulb. 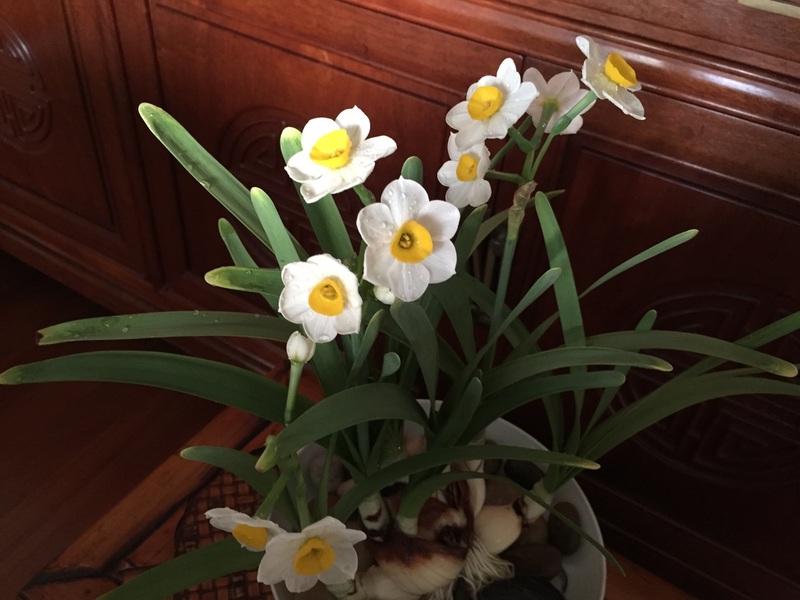 Line long axis of bulbs in an east west orientation and place in full sun. 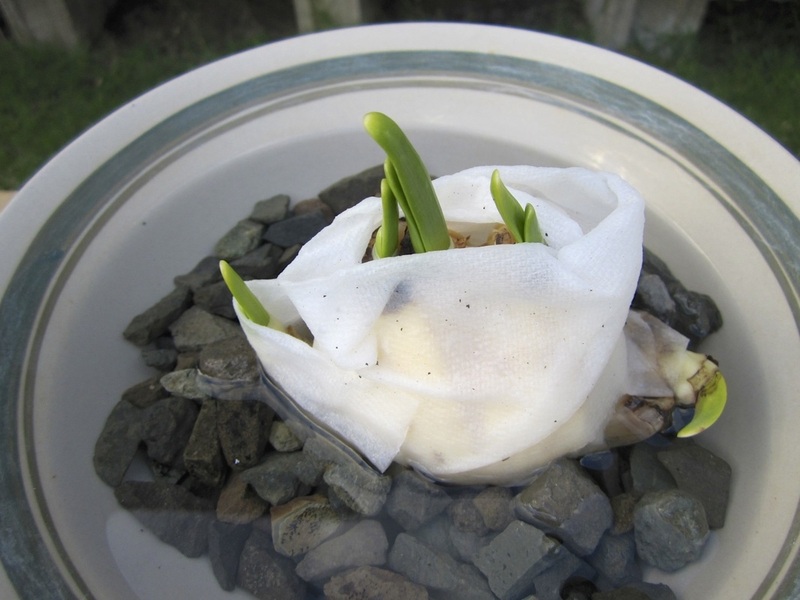 Change water at least once or twice a day. 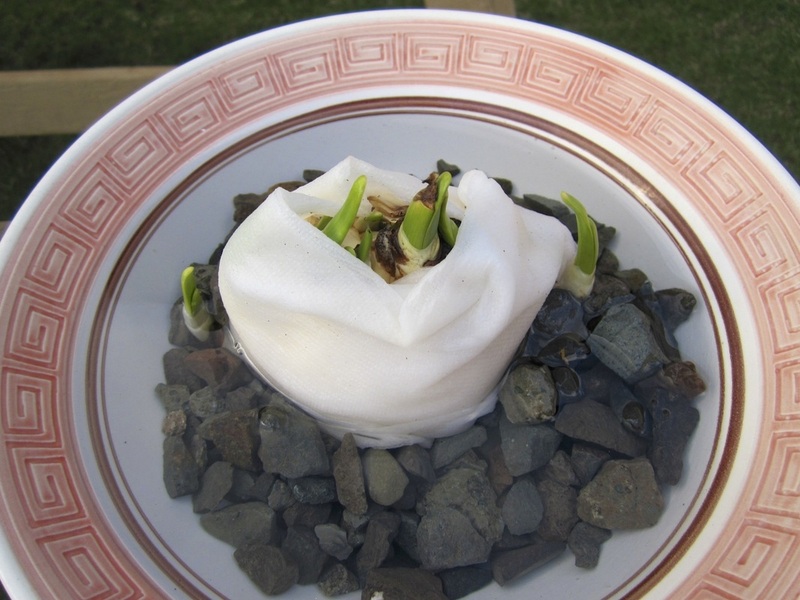 Good roots developing after 1 week. 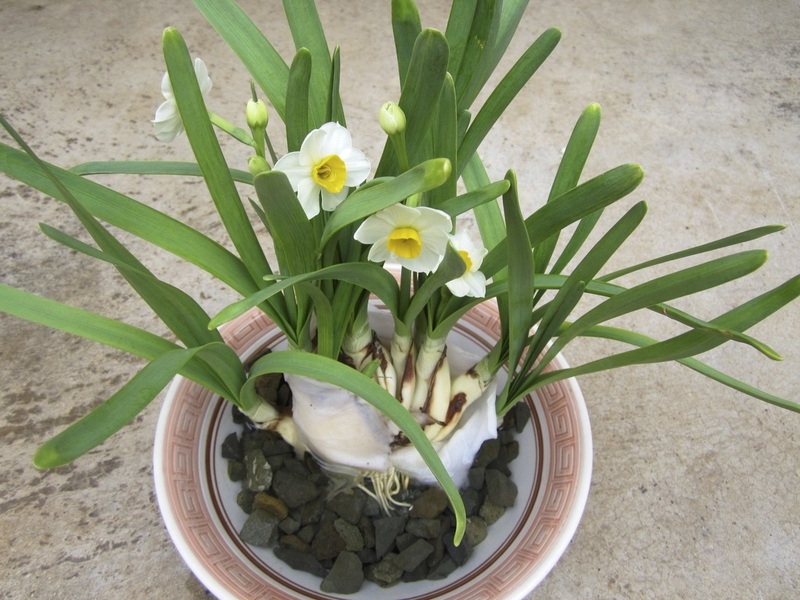 Shown below is an example of bulb with shoots growing only along the main axis, no undesirable side bulblets. 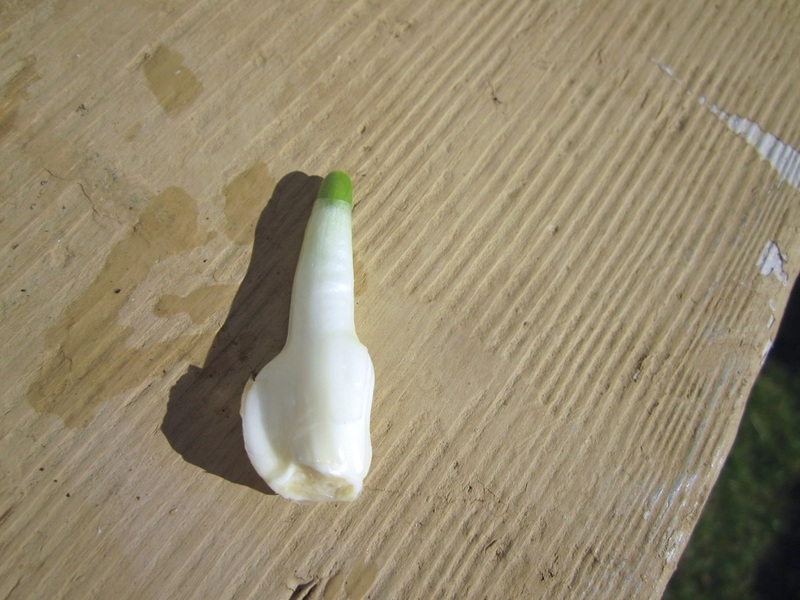 Example of an ideal bulb, without any side bulblets. 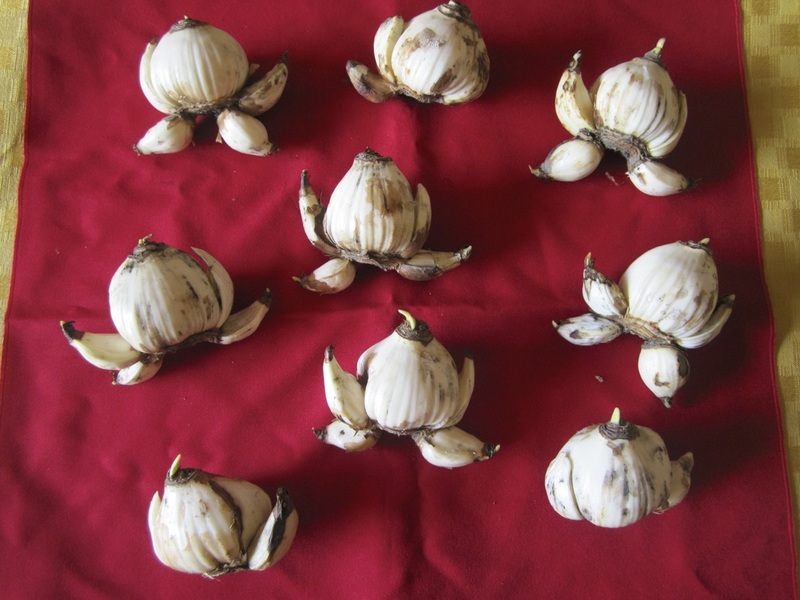 Shown below are images of unwanted side bulblets, also video shows how to remove them. 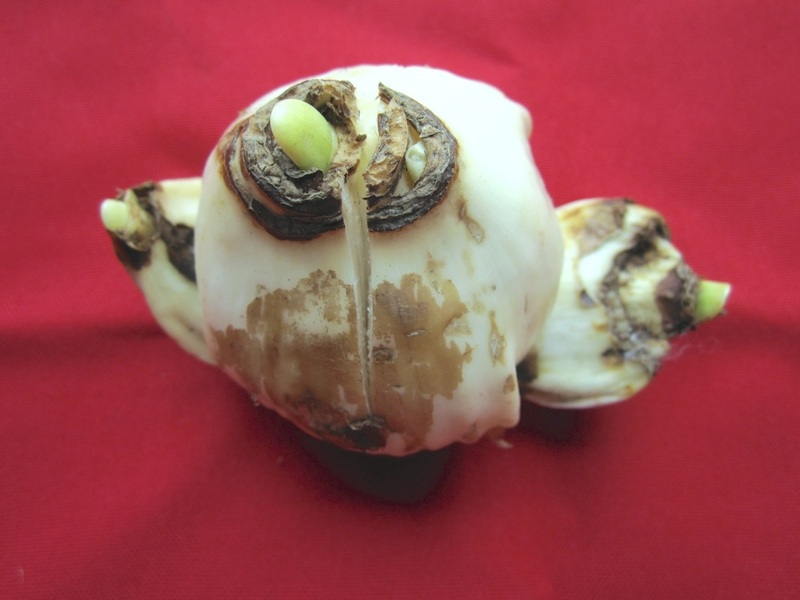 Undesirable side bulblets developing and will sap nutrients of bulb without providing blossoms. 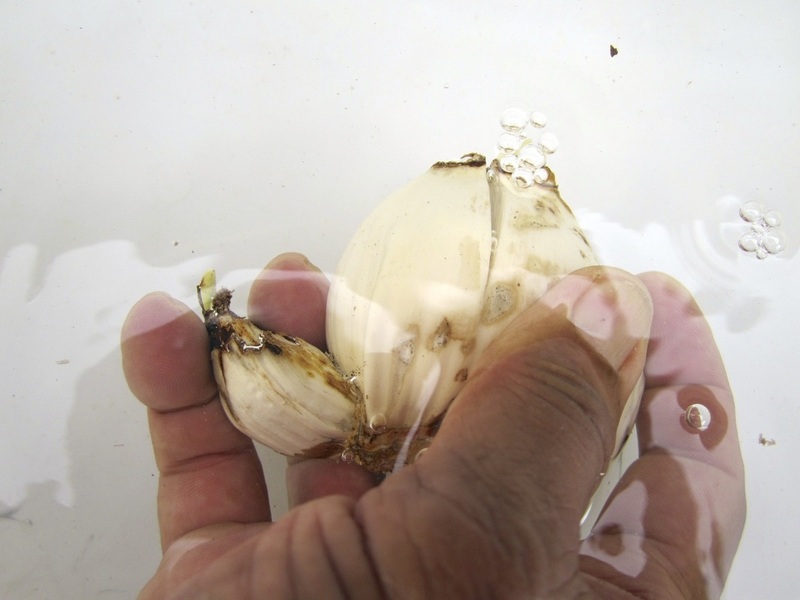 Sharply remove the unwanted bulblets. 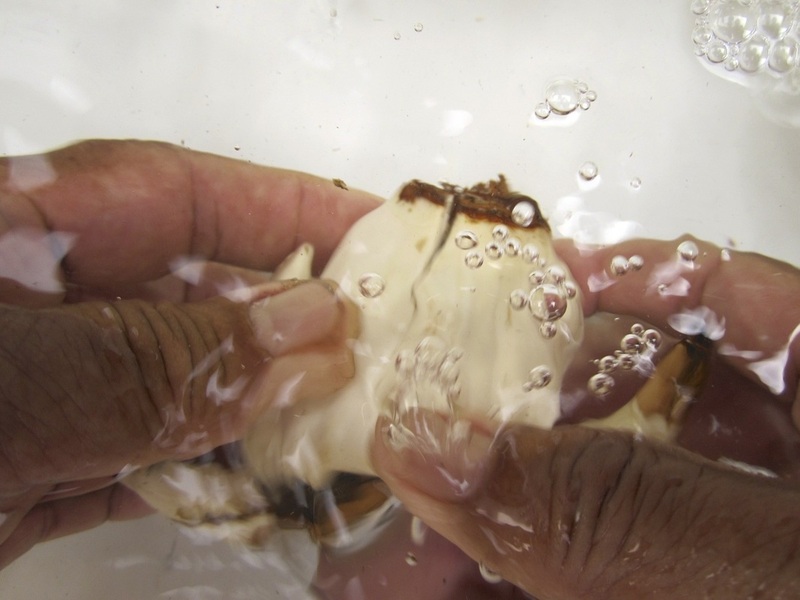 Removal of undesirable bulblet in one whole piece ideal, but removal in pieces acceptable. 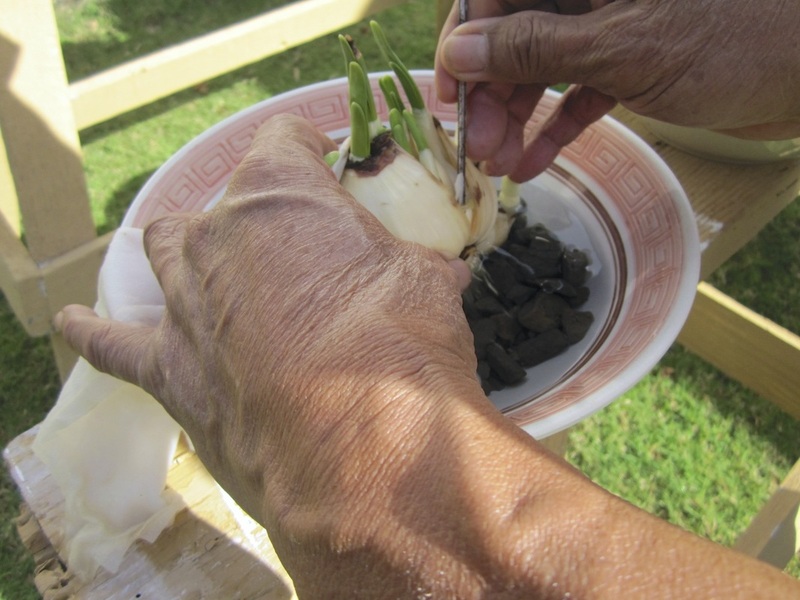 Removal of side bulblets completed. 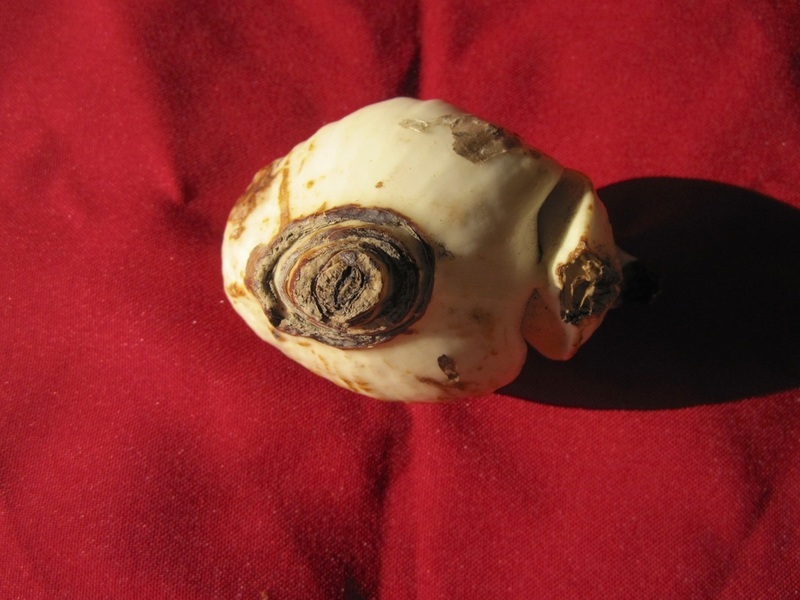 Now only shoots along the main axis remain.